Playing Area For Volleyball USA ~ the last post volleyball already posting about volleyball history of alex jupiter, on this occasion to further increase our knowledge in the game of volleyball, volleyballrule will give you all the about the field size volleyball player. The playing court is a rectangle measuring 18 x 9 m (59’ x 29’6”) surrounded by a free zone, which is a minimum of 3 m (9’10”) wide on all sides. The free playing space is the space above the playing area, which is free from any obstructions. The free playing space shall measure a minimum of 7 m (23’) in height from the playing surface. USAV 1.1a: The free zone may be a minimum of 2 m (6’6 3/4”) . It is not required that the free zone be symmetrical. USAV 1.1b: For nationally sanctioned competition and recommended for all other competitions, 7 m (23’) is the minimum free playing space (ceiling height). For FIVB World and Official Competitions, the free zone shall measure a minimum of 5 m (16’5”) from the side lines and 8 m (26’3”) from the end lines. The free playing space shall measure a minimum of 12.5 m (41’) in height from the playing surface. 1.2.1 The surface must be flat, horizontal and uniform. It must not present any danger of injury to the players. It is forbidden to play on rough or slippery surfaces. USAV 1.2.1: Players may mop the floor provided the 1st referee does not judge the action to be a delay. For FIVB World and Official Competitions, only a wooden or synthetic surface is allowed. Any surface must be previously approved by the FIVB. USAV 1.2.1: For nationally sanctioned competition, USA Volleyball must approve the surface. 1.2.2 On indoor courts the surface of the playing court must be of a light color. USAV 1.2.2: It is recommended the surface of the playing court be a light color or that other contrasting colors be used for the playing court and free zone. For FIVB World and Official Competitions, white colors are required for the lines. Other colors, different from each other, are required for the playing court and the free zone. 1.2.3 On outdoor courts a slope of 5 mm per meter is allowed for drainage. Court lines made of solid materials are forbidden. 1.3.1 All lines are 5 cm (2”) wide. They must be of a light color which is different from the color of the floor and from any other lines. USAV 1.3.1: Lines are not required to be of a light color as long as they contrast with the color of the floor. Two side lines and two end lines mark the playing court. Both side lines and end lines are drawn inside the dimensions of the playing court. 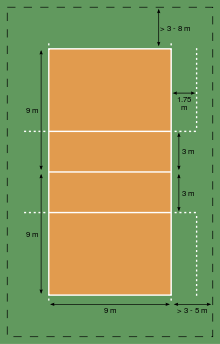 The axis of the center line divides the playing court into two equal courts measuring 9 x 9 m (29’6” x 29’6”) each; however, the entire width of the line is considered to belong to both courts equally. This line extends beneath the net from side line to side line. On each court, an attack line, whose rear edge is drawn 3 m (9’10”) back from the axis of the center line, marks the front zone. which extends from the attack line to the end line of the court, parallel to the side line and 1.75 meters [70”] from it) is composed of 15 cm (6”) short lines drawn 20 cm (8”) apart to mark the limit of the coach’s area of operation. USAV 1.3.4: For nationally sanctioned competitions, the extensions of the attack lines outside the court are required as described above. These extensions are optional for all other events. The coach’s restriction line is optional for all events.